Greetings. Happy December. I hope you all had a delightful Cyber Weekend. I am excited/thrilled/terrified to be launching my new book, Trajectory Book 1 for Amazon Kindle today. For those on epub, I have a plan for those to follow. Drop me a note or watch this space for updates about releases. If you want to try it out before you buy, I’m serializing the whole thing on Wattpad in what is sure to be an exciting adventure. No paper, though. Save trees! But gee, Rob, I didn’t know you were a writer? It’s true, but you know, I’ve always wanted to try writing a book-length novel. Last year when NaNoWriMo rolled around I figured, sure, I’ll give it a shot. I can write 50,000 words in a month. As the story started to evolve and the month ended, I was around 60k and had a map for three full-length books in my head. So I kept going. Fifty thousand words, it turns out, isn’t really a book-sized book. It is a small number. The series takes place in and around Mars and the near Mars-Jupiter asteroid belt. It tells the story of the Martian Colony New Providence, a sub-surface city built under the shadow of Ascraeus Mons, inside a long-dead lava tube hollowed out of the rock by the robotic constructors a century ago. The orbital station Lighthouse, and its companion sensor platform Watchtower, monitor the crews of a tiny fleet of antique mining ships that make their way back and forth to the belt for materials. The colony has survived, cut-off from Earth, for five generations after an unexplained disaster obliterated the home world. In this first book we follow the crews of the inbound space ships heading home from their mining operations. A bright student from the university’s space program discovers something unexpected in the asteroid belt. She and her friends make an effort to get the attention of the Station Commander to warn them that something strange is going on out there, so they can warn their ships – their families. And then stuff happens… I don’t want to give too much away here. You’ll have to read it. After this, my hope is to get Book 2 edited for release in three months. Now that I’ve got a more solid process, I think that’s reasonable. Who would have thought that editing was much harder than churning out raw material? Figures. It’s the least fun part and I have a new respect for people who do this well. Fortunately, I’ve got time. I’ll be pushing chapters to Wattpad 3 days a week starting now. Mondays, Wednesdays and Fridays will be New Chapter Days for the next 14 weeks. That should be enough time to get the next book ready, right? During all that, I expect to have a bit more to say about the publishing process, complaining about the tools and describing what a pain in the arse editing is. If that kind of behind-the-scenes grumbling sounds like a good time, be sure to check back and keep an eye on my twitter feed. 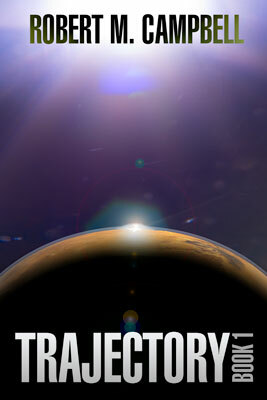 Trajectory Book 1 available in all markets. English. 65000 words, 255 pages. Everyone says they’re writing a novel. Ol’ Bob actually does it. Congratulations. You wrote an actual book? That’s crazy! Crazy like a fox….I never knew you had it in you. Way to go Rob, look forward to reading it. Do the colonists all stick together through the story?